Dr. Tatosian was born and raised in St. Louis, Missiouri. He attended the University of Missouri-St. Louis and recieved his B.S. degree in chemistry. He then recieved his dental degree from the University of Missouri-Kansas City followed by a general practice residency at the Veterans Administration Hospital at Kansas City. 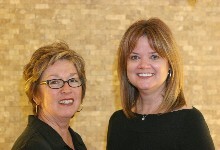 When you call or arrive to our office you will be greeted by either Sue (left) or Stephany (right). They will assist you with registration, scheduling, insurance questions, communications with your referring doctor's office or a number of other issues that may come up. They look forward to meeting you and helping with your dental needs. 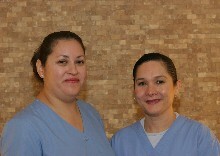 Tania (left) and Aida (right) assist Dr. Tatosian chairside during your endodontic procedure. They are highly skilled and will help with making your experience here comforting.